Symptoms Of Rotator Cuff Injury are pretty much the same whether there is an actual rip/tear injury or not. It is very important to understand that one can have even debilitating rotator cuff pain with no actual injury. So we're not just going to talk about rotator cuff injury symptoms, we're goign to talk about non-injury symptoms and rotator cuff tear symptoms. Lots of people think they have an injury because they have pain. So...do you actually have an injury? Or do you just have symptoms? If there's no actual rip/tear injury, then you basically have Shoulder Tendonitis. These symptoms can come on over time, or can show up suddenly (but the Pain Causing Dynamic has been in play for a long time). Notice how similar rotator cuff tear symptoms are to rotator cuff symptoms where there is no tear? So....if the symptoms can be the same whether there is injury or just rotator cuff tendonitis...what do you do about it? First off, if you have rotator cuff symptoms, you need to find out if you have an actual rotator cuff tear or not. Officially the only way to do this is to see a doctor. You'll either get an MRI or CAT scan (xray isn't the best option for visualizing tendons and tendon injury). That way you can conclusively determine whther you're having rotator cuff tear symptoms, or just bad shoulder tendonitis symptoms. Potentially, you could have a bone fracture from Osteoporosis. Then, if you do have an actual injury, talk with your doctor about rotator cuff surgery. 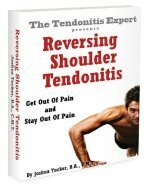 Then, whether you do or don't have an actual injury, get to work reversing the tendonitis dynamic. This will help you recover from surgery better and faster. And if you don't have a tear, it is how you are going to get rid of the symptoms of rotator cuff injury (without the 'injury' part). Confirm that you have rotator cuff tear symptoms. If you don't, then you don't have an actual rotator cuff injury, you just have a shoulder tendonitis dynamic causing pain and problem. If yes, then you most likely need medical care and surgery, and then get to work reversing the tendonitis dynamic (which will help you recover from surgery better and faster). If no, then get to work reversing the tendonitis dynamic. Return to the top of this Symptoms Of Rotator Cuff Injury page.